Josh Thomson (pictured) wanted Nick Diaz (or not, because his phone was allegedly stolen and it was the culprit who called out Diaz) in his hometown of San Jose. Well, whether it was a drunk-tweeting Thomson or the thief that demanded the tango, half of the request was granted. On Friday, the UFC announced Thomson will battle Michael Johnson at UFC on FOX 12. The July 26 event takes place inside SAP Center in San Jose, California. Johnson, meanwhile, has managed to get his career back on track after losing two straight scraps. 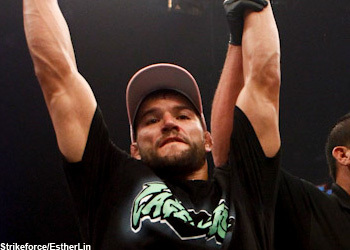 “The Ultimate Fighter 12” runner-up will be riding a three-fight winning streak into the shootout.